The teachers and students at OTHS (Oakville-Trafalgar High School). 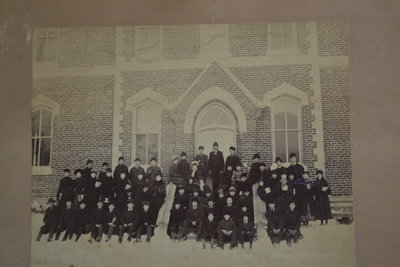 Undated but may well be the student body when the school opened. Oakville Trafalgar High School was founded in 1908, and located on Reynolds Street in the town of Oakville until 1992. As well as referring to it as "Oakville High School", it is also referred to by the acronyms, "OT" or "OTHS".